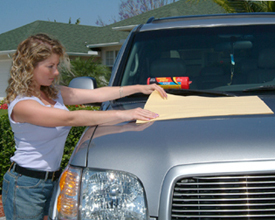 New age chamois is absorbent and mildew resistant—even when stored wet! If you were to tabulate a pros and cons list on genuine chamois, the pros list may read: Superior absorbency, shine enhancing qualities, no residue from the material itself, durablility, and the signature non-abrasive, gentle feel. Now, imagine a chamois with all those characteristics, but absolutely none of the drawbacks. The Water Sprite Plus is a scientifically engineered super-chamois out of Holland. The improvements? High absorbency, not only of water, but acts like a sponge towards dirt and grime pulling them safely away from the car’s surface. (Works just as well on windows and other surfaces.) . Maintaining consists only of rinsing. The Water Sprite Plus can be stored wet (!) in the canister it came in, without fear of mildew or bacteria. Unlike genuine chamois, you CAN use it with household chemicals. It doesn’t contain any paper or fabric, but it’s high-tech fibers look and feel remarkably close—an upgraded twist on the traditional chamois. The Water Sprite Plus is unarguably useful for any cleaning, drying or polishing task. It will not remove wax coatings. Its portability is a real plus. Keep it in your trunk or glove compartment. No matter where you are, it’s always ready for action. You can use it and stash it quickly, no messy cloths hanging around to dry; put it back in its can until next time. Its performance against dirt, grime, water spots and streaking is nothing short of amazing. I swear these were made for boating. They quickly make any surface bone-dry and clean, but you don’t have to waste one minute worrying about the effects of humidity and moisture to your Water Sprite Plus. They love the water. Great for pools and beach trips, too. I keep one in the garage for drying patio furniture after one of our South Florida afternoon showers. Kids and pets love them for drying off. Never use hot water on your Water Sprite. The makers suggest laying it across the wet surface area like a sheet—four square feet! As you pull it off it absorbs all residue, dirt and moisture. It glides effortlessly without sticking. Simply rinse again when finished and return to its storage container. Great product. Works well and is machine washable. Used this product a few times already and like how it performs. 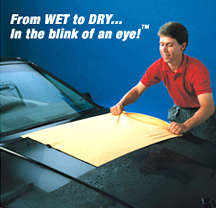 It doesn't dry your car 100%, but rather removes the majority (96-99%) of the water, and I follow-up with a microfiber drying towel (i.e. Guzzler) for a completely dry surface. This combination works much better than just a microfiber or just a chamois, and one microfiber drying towel is more than enough for a couple large SUVs. Laying the chamois flat and pulling it to dry the surface removes water very well, and the surface looks and feels clean. Water wrings out of this chamois very easily and Water Sprite Plus Chamois is easier to care for and maintain than traditional chamois. I love Water Sprite Chamois. They work awesome and are very durable. The more it is used the better it works. I have two older sprites and this one is not like either. Sprite has gone to a more of a sponge than the original. I like the original much better, especially for $19 dollars. ConsThey are like a sponge towel now. Mhy family has used Water Sprite chamois for the last 35 years & I have not been able to find them in Edmonton or Calgary, Alberta. Nothing dries like Water Sprite & I am getting desparate!! !